In addition, people who are approved via the Global Entry program can also participate in TSA Pre-Check, which allows people to skip regular TSA security lines at participating airports and go through an expedited line —without having to remove shoes or other clothing items, open laptops, or do any of the other things that take up time in line. You plan to travel internationally any time in the next five years. 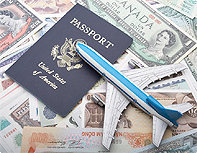 The more you travel, of course, the more worthwhile it will be —but many reviewers indicated that Global Entry is worth the time savings even if you travel internationally once a year or less. You have the Amex Platinum card, as the $100 fee is refunded to you as a statement credit. Other cards may also offer this reimbursement —check with your credit card company to be sure. If you are a Canadian resident, the news is even better! If you qualify for Canada’s expedited-traveler program, called Nexus (which only costs $50), you get Global Entry for free. Finally, if you travel through Texas' largest airports you might also be wondering about the CLEAR kiosk popping up. Click HERE to find out more about how it works.